Ravana, Indrajit played a major role. Before every battle Indrajit used to perform a Yagna, which made him invincible in battle. He succeeded in defeating Lakshmana twice and Lord Rama once in battle. But finally Lakshmana with the help of Vibhishana disrupted his Yagna and engaged in a battle with him for three days and three nights in which Indrajit was killed. Indrajit was born to Mandodari and Ravana. When he was born his birth cry sounded like a thunder due to which he was named Meghanada. In one of the incidents he managed to defeat the King of Devas, Indra. After this incident he came to be known as Indrajit, which means the conqueror of Indra. Shukra, the guru of the demons guided Indrajit towards possessing several divine celestial weapons such as Pashupatastra, Brahmastra and Vaishnavastra at a very young age. Indrajit had a wife named Sulochana, who was the daughter of Shesha Naga, the king of serpents. Sulochana is also known by the name of Prameela. In a battle known as Devasura Sangram, Indrajit defeated Indra, tied him up and mounted him on his celestial chariot. But soon Lord Brahma intervened and asked Indrajit to release him. Indrajit obliged to this and was asked by Brahma to wish for any boon. 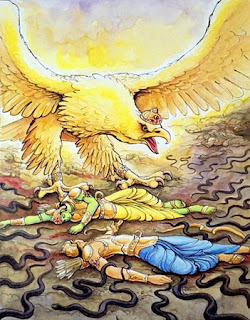 Indrajit asked for immortality, but Lord Brahma told him that this was against the law of nature, therefore Indrajit was granted with another boon. According to this boon Indrajit would never be defeated in a battle until his Yagna before the battle is disturbed or destroyed. Lakshmana took help of Vibhishana and disturbed Indrajit’s Yagna. Lakshmana finally killed Indrajit and emerged victorious.